Outside temperatures in Thunder Bay Ontario at around 7:30 local time this morning are -14°C, which with the windchill feels like -20°C. It’s probably safe to say that most of Thunder Bay’s 121,000 residents are indoors: either inside the city’s 52,000 private dwellings or in its industrial, commercial, or institutional buildings. Thunder Bay, Ontario, is a beautiful city. This morning (December 11 2017) the outside temperature there was minus 14°C, or minus 20 with the windchill. This meant the city’s residential dwellings collectively needed 248 megawatts of heat just to keep the indoor temperature at 18.3°C. Even if the city residents are not at this minute physically inside their 52,000 homes, their homes are likely staying warm—meaning something, some force, is keeping the inside temperature at least 18.3°C but likely more in the range of 21° to 23°. That puts the difference between the outside and inside temperatures to 38.3 Celsius degrees, or 38.3 Kelvins. How much energy was being used in Thunder Bay Ontario at 7:30 in the morning on December 11 2017 to maintain the indoor temperature inside the 52,000 private households at at least 18.3°C, given that at that time it was minus 20 outside? Let’s assume some physical dimensions of an “average” private dwelling in Thunder Bay. Let’s assume the following component dimensions for each of the 52,000 dwellings. Floor area: 55.5 square metres. Roof area: 55.5 square metres. Non-windowed outside wall area: 157.5 square metres. Floor U-factor: 0.2 watts per square meter Kelvin. Non-windowed wall U-factor: 0.4 watts. Meaning that private dwellings in Thunder Bay collectively required 248 million watts to maintain their inside temperatures at 18.3°C, i.e. to fight off an effective temperature difference of 38.3°. For this reason, I dispute the Ontario Independent Electricity System Operator’s assertion that Thunder Bay’s “energy” peak is anywhere near 168 megawatts (scroll to the bottom of the linked page, to the map of Ontario). The IESO in its graphic uses data from the Ontario Energy Board’s 2016 Yearbook of Electricity Distributors. In the Thunder Bay section in the General tab of the Excel version of that document, you see where the IESO got the figure. By my estimate, Thunder Bay’s residential heat demand at seven thirty local time on December 11 2017, a moderately cold late autumn day in that part of the world, is 80 MW above the OEB’s reported electricity demand for 2016, which includes more than 5,000 non-residential customers, 488 of whom are reported as having used more than 50 kilowatts. I believe my estimate of Thunder Bay heat demand is a very conservative one. (It is also a highly simplistic one, but I’m just looking for a ballpark idea of the heat demand.) As I mentioned, an indoor basis temperature of 18.3°C is the very minimum. Most people, myself included, consider that much too cold. The dimensions I gave for the outside components indicate, as you probably guessed, a very modest two-storey detached home: each storey 24 feet by 24 feet, including kitchen and bathroom. As for my estimated U-factors, they may be a bit high for Thunder Bay, but I would have to do more digging to get a better handle. If you’re in Thunder Bay, or have some insight into this, let me know in the comments. Regardless. 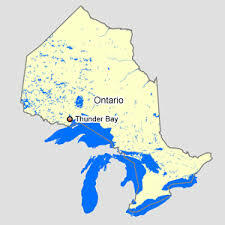 The demand for electric heating in Thunder Bay may be reflected in the OEB’s reported difference of 49.1 MW between average peak and winter peak. My (highly conservative) estimate for this morning puts heat demand 80 MW above the total winter electrical peak. How much Thunder Bay heat demand is being met by electricity? If we go with the 49.1 MW winter-average peak difference, and say that 49.1 MW of the heat demand between seven and eight this morning was being met with electricity, then we could say that 198.9 MW of heat in that hour came from combustible fuels. Meaning, Thunder Bay’s non-transportation energy demand in that hour was roughly 318.1 MW (combustible heat plus non-heat electricity). That is nearly 1.9 times what the IESO says was Thunder Bay’s peak energy demand in 2016. Is the word “energy” a typo? It should be “electricity.” The IESO is an electricity system operator. It should report electricity peaks as electricity peaks, not energy peaks. By “was losing” I am assuming of course that people in charge of those dwellings desired that the indoor temperature remains at least 18.3°C. If that was indeed the case then their measures to maintain that temperature consisted of replenishing the heat that was migrating to outside at the rate of 4,760 joules per second. These gross inaccuracies are one reason why no institution of higher learning should grant a BS or BA in anything but the fine or performing arts to anyone who has not passed a freshman weed-out regime of calculus, chemistry and physics. Yes, that includes English and journalism. go easy — I said ballpark.